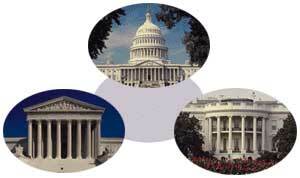 What are the three major branches of Government? What are there roles? Who watches over them and makes sure that they are following the law and the Constitution? The United States has a 3 branch system with Checks and Balances in Place in order to make sure that all of the laws set down by Our Four Fathers in the United States Constitution are being upheld too the letter of the law. Essential Question:What are the major roles of the 3 branches of government, and how does each one affect our lives either directly or indirectly? This lesson takes into account how each of the branches were started, who is the leader of each branch, and the responsibility of each (including the checks and balances of each branch of government). It will compare each branch and provide games, writing and other activities throughout the week in order to complete this quest.